Leave it to Martha Stewart to turn tomato bread into a work of art. Using heirloom tomatoes from the market, bread from one of our artisan bakers and a flavorful selection of spices, oils and vinegars, this is an appetizer you will be proud to serve your guests. Trim top crust of loaf slightly to make a flat surface, then slice loaf horizontally to create 2 long halves. Grill bread until moderately charred, 1 to 2 minutes on each side. Rub bread on both sides of each half with garlic and place, cut sides up, on a platter. 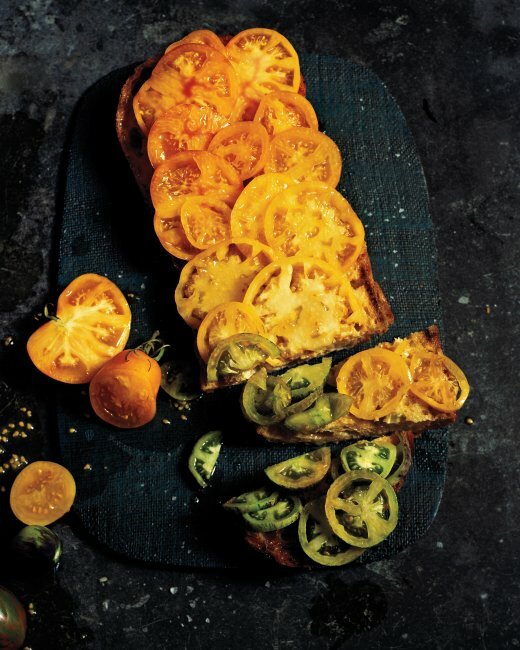 Shingle tomato slices on bread, arranging by color and covering each entire surface. Drizzle remaining oil over tomatoes and season with remaining 3/4 teaspoon salt. Cut tomato-topped bread into wedges and serve.